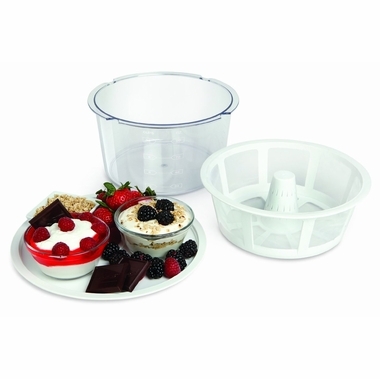 Now you can prepare Greek yogurt dishes quickly and easily with Euro-Cuisine Greek Yogurt Maker. This unique strainer kit transforms up to 2 quarts of ordinary yogurt into thick, creamy Greek yogurt in a matter of hours - all inside your refrigerator. Enjoy healthy dips and spreads, delicious Tzatziki, low-calorie salad toppings, or delicious sweet berry desserts with this Greek yogurt kit! Each component is dishwasher safe and BPA-Free. The unit works by allowing the whey (liquid) in yogurt to drain away, leaving the curds behind. Recipe book included.